Crafted from steel and featuring a rich Roletta Brown finish, the Oxford Side Chair is a charming piece to decorate your dining space. Upholstered in a matching Stallion Brown, the chair emanates warm brown tones to soften and soothe, and the upholstered seat ensures long lasting comfort for you and your dinner guests to enjoy. A decorative ribbon back showcases intricate scroll metalwork to draw the eyes, lending genuine visual interest and appeal to your dining room. Gently curved front legs give a sense of shape and movement to the piece, offering a stark contrast to the back legs which stand straight and tall. Traditional with a formal feel, this dining side chair is an easy way to dress up your kitchen or dining space and add extra, stylish seating to your home. The Oxford Upholstered Side Chair with Scrolled Back by Pastel Minson at AHFA in the area. Product availability may vary. Contact us for the most current availability on this product. 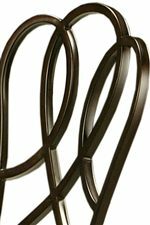 Finish Metalwork freatures a rich Rosetta Brown finish. Elegant and refined, the Oxford collection offers just the right look to dress up your home. Crafted from steel with a rich Roletta Brown finish, Oxford features comfortable and stylish seating for your dining area. 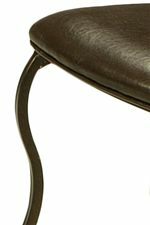 Scrolled metalwork, curved legs, and warm brown tones all work together to fashion a look that is as captivating as it is classy. The Oxford collection is a great option if you are looking for Traditional furniture in the area.